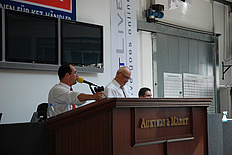 The publicly appointed and duly sworn auctioneer Karl Rolf Muth founds the company Auktion & Markt. Initially, used vehicles are offered for sale in live auctions to dealers and private individuals. Auktion & Markt holds vehicle auctions exclusively for registered motor vehicle dealers; private buyers do not have access anymore. For the first time Auktion & Markt establishes its own auction centres in Germany and opens offices abroad. An online auction platform for used vehicles is launched: Autobid.de. Since then Autobid.de has become one of the most experienced and successful B2B platforms in Europe. Auktion & Markt assumes the legal form of a corporation. Since then the CEO has been the founder and owner, Karl Rolf Muth. The subsidiary “Auktion & Markt Autobid S.L.” is founded in Spain to take care of customers there. The vision of combining live and online auctions takes shape in the form of the first so-called Netlive auctions. In these auctions, dealers can bid along both live on location as well as online, in the comfort of their own office. Offices are opened in Luxemburg, Romania and Poland. The Auction Centre Baltic States opens in Riga. Autobid.de is available in 22 languages. The exclusive connection with the partner market webmobil24 is established. Now it is possible to directly export vehicles purchased in auctions. Auktion & Markt’s quality management and environmental management systems are certified. Autobid.de offers the first App for mobile use. Autobid.de is introduced onto the market as independent brand of Auktion & Markt AG, incorporating all business divisions. Auto-auctions.gr is the first Autobid.de license partner abroad. The new propertybid.de Division, property auctions, is being established and will operate as a second brand alongside Autobid.de from now on. The new Autobid.de Consulting Division expands the range of services offered by Autobid.de. The new Classicbid division is starting business operations – trading and auctions with classic cars. Autobid.de introduces the Notification Center so that customers can always be kept up to date about their individually configured status reports. Autobid.de launches a new app with a sophisticated bidder function in 22 languages onto the market. Autobid.de has the winning image in the vehicle industry and receives the Best Brands Award. As owner-operated company, for years Auktion & Markt has promoted growth by building long-term business relationships based on trust. Personal contact and a close relationship with our customers – regardless whether suppliers or buyers – are of fundamental importance to us. It’s not for nothing that virtually the entire board of management will be familiar to you from seeing them on the auction platform at one time or another. Being on the cutting edge of auction activity and at the hub of the market are just as important to Auktion & Markt AG’s company philosophy as the continual use of new technologies with the brand Autobid.de. That is how we link the tradition of an auction company that has more than 30 years' experience in thousands of auctions with innovations of the future.